Surrender is an interesting word that has different meanings dependent on your present circumstances. In Russia, the word that is used is подчиненный which means subordination! If we were fighting a war we might capitulate against stronger enemies and surrender. If we have done wrong, we may surrender our freedom, or driving license. In an argument which I cannot win, I may give in, surrender my idea, thought, paradigm or intransigence! 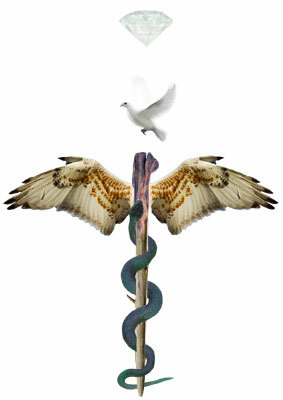 Surrender is an element which we have added to the old caduceus, and is characterized by a dove. 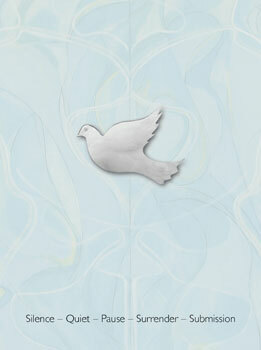 The dove infers peace, the Holy Spirit, homecoming (Noah’s dove returned with a piece of olive tree in its beak). It beckons towards the human capacity of choice. We can surrender to things lower or to elements Higher. The lower ones are simple to explain. We can surrender to (fall towards or down to) our history, pride, feelings and emotions–fears and things unknown, a lack of faith, habits, sexuality and gender, and lack of attentiveness of what takes power over one, and to ideas, thoughts, beliefs and philosophies which take the person away from surrender. The dove sits above the conventional caduceus, and its position, in rank, is higher than the eagle. This reminds us that when we surrender our vision and our maps take a secondary place to some other (descendent) understanding separate from our own mind’s eye, and on a positive note, when we surrender our vision can be illumined and informed rather than filtered and biased through our own reflexive thoughts. Because we have a scavenger-like mind (the eagle), and also obsessive (the claws of the eagle), not withstanding far-seeing and possessing a clarity and ability to scour for detail we can, if we are careless kill the dove, as we allow our reflexive mind to fly too high and forget to tame it, pull it back to earth, feed it other morsels (thoughts) other than the dove of peace (information coming from The Source other than your own cleverness). In almost every religious and spiritual tradition, surrender is a key element. It behoves us to be humble, to bow the head, to prostrate in front of a Higher mind.